Arsenal attacker Lukas Podolski is finally set to leave the North London side as reports revealed strong interest from Serie A side Inter Milan. Arsenal attacker Lukas Podolski is finally set to leave the North London side as reports revealed strong interest from Serie A club Inter Milan. 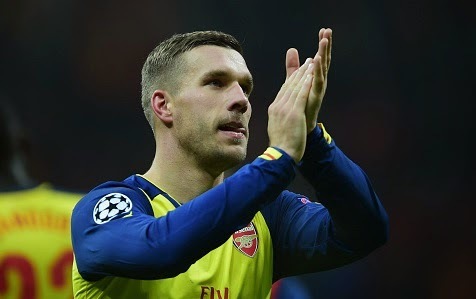 Italian media Corriere Dello Sport have reported that Serie A outfit Inter Milan are keen to sign Arsenal German forward Lukas Podolski as the World Cup winner is struggling in London. Corriere Dello Sport reported that both the sides are in advanced negotiations with the Gunners for the German star. The 29-year-old has been in continuous link for the past few weeks as he is planning for a move for regular football. He has only made six Premier League appearances for Arsenal this season. The Italian giants Inter Milan are eyeing him for a loan move with an option to buy him at the end of the season for a fee around €8million. Podolski might accept the offer only for regular football despite of Inter Milan’s form right now. The Italian outfit are not the part of any European competition. The 2010 Champions League winners have taken a u-turn in the past few seasons, they are struggling in every competition. Currently, they are on 11th spot in the Serie A.